A simple question that most people don’t probably wonder much. When yo have a typical eyesight, you see well, or you can put on glasses and will have a fairly large, uniform field of vision, can see the letters on that wall far away and can read print and have no problems figuring if that bottle is air refreshener or shaving cream. When what you see is less, or distorted, or always changes, it can be difficult to try to explain. 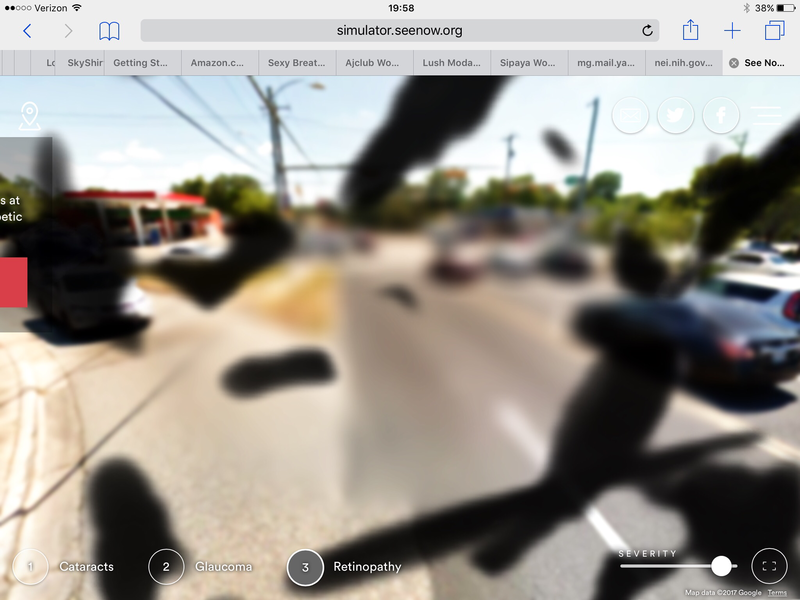 Here are three simulations of what a visually impaired but not blind world can look like. They were all done with http://simulator.seenow.org. 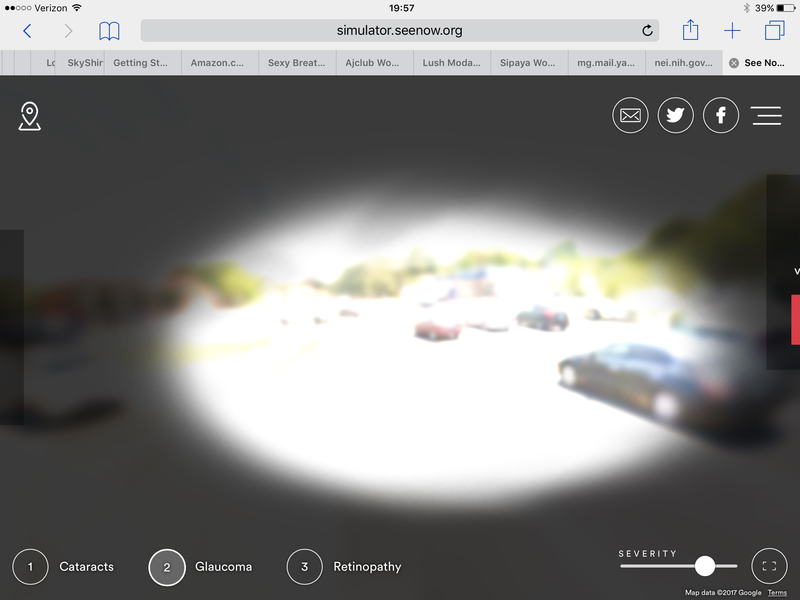 With that simulator you will enter an address you want to explore, and can then try it as a cataract, glaucoma, and retinopathy views. Often a person with one eye condition may end up developing also other eye conditions, but at least it can be helpful for having a reference. Not everyone with a visual impairment is blind without light perception. Not everyone with a white cane has a world of darkness. And many of those with cataracts still drive. What does my world look like? It depends and it changes. It’s blurry. It’s often got too much lights, so my eyes hurt. It also looks like seeing thru marble. 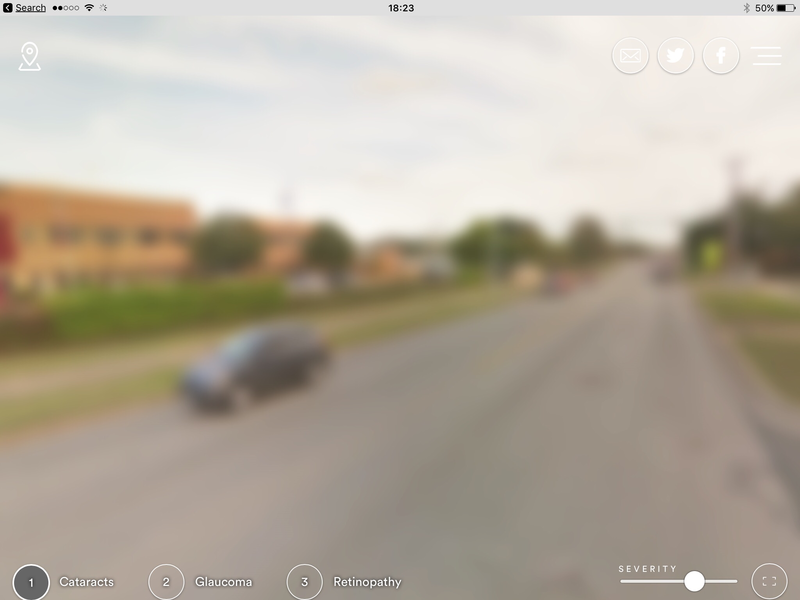 The retinopathy view shows it a bit like that, but replace the big blotches with marble. I can see the marble when i stare at anything when it’s bright; the sky, the walls, a screen. There are also giant halos when there is light, and when it’s nighttime, when you can detect where the crosswalk or curb is with your eyes, I rely om my memory. In nighttime it’s just some patterns of light, when you can’t detect how far a car is or if or where there might be a pedestrian light. While in daytime it can feel like not quite fitting in the usual sighted world, in nighttime it’s both a happiness of not having to try to pretend, and onn the same time it feels often so vulnerable. You see me, I don’t see you. Or I can see a picture and not have a clue what I’m looking at. I can maybe recognize there is a picture of a human face, and not alwaya guess correctly what the person looks like: male or female, young or old, black or white or purple. Think of the shadows a tree might cast. A pattern with dark and light, for branches and leaves and where sun shines thru. When what you see is just the light go thru with that pattern. Or somewhere you see a similar gorgeous pattern, when to me it’s just blurry darkness. Or for you the night sky might look like those lovely nightscape photographs of a city, while I struggle finding a crosswalk and my way to a bus stop, being all alone in a blurry darkness, while others see me and I don’t see them. Or I enter the room, notice a person behind Mary’s desk and will assume it’s Mary. Or I’m sitting right in front of you, can’t see your facial expressions, don’t notice you are nine months pregnant, yet try to give the impression of looking at you, in your direction, to play with the sighted world’s eye contact game’s rules. It feels weird adding pictures here, even if I post frequently pictures both in twitter and instagram. But maybe for omxe, for this topic, a few pictures might try to express a bit of those “more than a thousand words”. The location of those pictures is where I often walk. Next Next post: Why we need more than Autism ‘awareness’ … all year ‘round!